The prosthetics department assesses, custom designs, creates, and fits prosthetics for people of all ages. Prosthetics is the evaluation, design, and creation of artificial limbs for those who have had an amputation or were born without a limb. 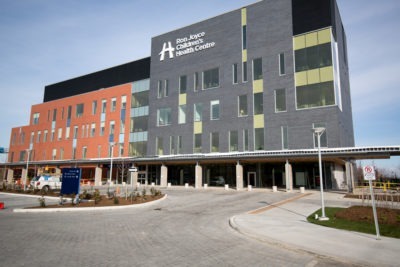 The services provided by the Prosthetic and Orthotic department at the Ron Joyce Children’s Health Centre are not funded in any way through the hospital or through OHIP. Our policy is that full payment is required for services provided at the time the prosthesis or orthosis is dispensed to you. To assist you, the department accepts Visa, Mastercard, American express, debit cards, personal cheques, and cash. In (most) ceratin cases you will be asked to leave a deposit at the time of the assessment before any work will be started. Certain devices may qualify for funding through the Assistive Devices Program (ADP). Your clinician will be able to inform you if the device you are being assessed for falls within this funding category. For more information about ADP funding for orthotic devices and frequently asked questions, or to download the application form, visit the Ministry of Health and Long-Term Care Central Forms Repository. You physician will need to sign the form and provide a diagnosis to access ADP funding. Bringing your signed copy of the ADP form to your first appointment speeds up the process of scheduling your orthotic fitting appointment. Our staff will help complete and submit the application to the Ministry of Health on your behalf. If you have any questions, please contact our office during regular business hours at 905-521-2607. The Assistive Device Program will assist with 75% or stated maximum of approved components and procedures. The Assistive Devices program does not provide funding for several items needed to wear your prosthesis. Any amount not covered by ADP is your responsibility. If you have benefits through your work place we recommend submitting the prosthestic estimate for predetermination to ensure coverage and the amount of coverage. This predetermination can ensure your reimbursement once you have submitted to the insurance company. If you are on provincial social assistance the Assistive Device Program offers an increased amount of funding assistance. Your regional social services may assist you with the remaining cost payable by you. Please contact the department’s Financial Assistant for further information. Lodges: Masonic, Elks and Royal Purple, IOOF, and Moose Lodge. Many of these lodges will assist people who live in their community. Many churches have benevolent funds for parishioners and families. You will need to write a letter requesting assistance to your chosen agency, we will provide you with an estimate to include with your request. Veterans may get assistance from the Department of Veterans Affairs. War Amps is a non-profit organization that will provide funding assistance every three years. Please see their website War Amps Canada for more information. If you would like to access War Amps please notify your prosthetic clinician. Please check your area for an amputee association. They may be able to assist with a small amount of funding or have information regarding area clubs willing to assist with funding. Several patients have organized fundraisers to help raise funds for their prosthesis e.g. Garage sales, car washes, spaghetti suppers etc. If you have any questions regarding funding of any devices our department dispenses please contact our departmental Financial Assistant at 905-521-2607.